Mooting sees two pairs of students argue a fictitious legal appeal case before a ‘judge’ (normally a lecturer or postgraduate student) in simulated court proceedings. It is a useful supplement to a law degree as it demonstrates to students how legal knowledge may be applied in real life, and encourages the development of analytical, interpretational and public speaking skills. Organised by students Sarina Worley, Mistress of the Moot, and Bethany Miller, President of the Bangor Student Law Society, the subject of the Supreme Court moot was a legal dispute concerning a young man who climbed over a swimming pool fence on a warm summer’s evening and dived into the swimming pool, suffering horrific injuries at the shallow end. Defending were Herbert Farrington and Simon Williams, ably supported by Legal Researchers Nicola Pearson and David Gibbon; while the Applicant team was composed of Adam Gulliver and Andrew Galley, with research support provided by Ana-Victoria Dan and Aaron Clegg. 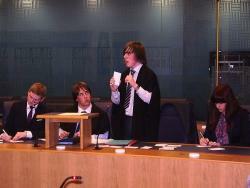 The Bench was presided over by Law lecturer and Solicitor Gwilym Owen. 20 year old Andrew Galley from Leeds was a member of the winning team, and commented: “Participating in the Bangor Law School Moot competition was extremely rewarding and worthwhile. In allowing individuals to decide who they want to work with, it tests how well you can work amongst people you know socially in a professional mindset and setting. The case itself was challenging; at first glance it seemed one-sided, but upon actually reading and considering all the details it was a very balanced case. Seeing and presenting in the Supreme Court also proved rewarding – it invoked a sense of wonder and amazement amongst us all. I would definitely like to enter the competition again”. 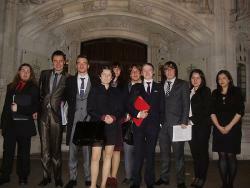 Bangor Law School will achieve another historic first in April 2013 when it becomes the first ever Welsh law school to participate in the world-renowned Telders Moot at the Hague in the Netherlands. A team is currently in preparation under the tutelage of Dr Evelyne Schmid, ably assisted by Yvonne McDermott, both lecturers at Bangor.